Iran Citric acid has many advantages to using in drilling muds and the noticeable part of this acid uses in drilling industry and our company supporting this acid widely in universal markets. This acid exists in tow shapes anhydrous and monohydrate which the main difference is the first one is powder and second one is in liquid shape. 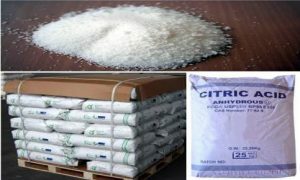 Citric acid usually uses as PH controller to reduce the alkalinity and also plays an important role to carry the cuttings and omit the calcium from drilling fluids and many other which mentions in following. citric acid with general formula C6H8O7 discovered in many years ago and it first usage refers to drinks. also it seen in fruits like lemon or orange and naturally exists in the nature. However, nowadays the application of this acid isn’t limiting as same as old times, and in addition to food industry it has wide applications from oil wells drilling to use in foods as flavor additive. Citricacid has various grades in industrial or food grades which all of is supporting by ATDM company. Citric acid is some type of acids which has low reactivity in compare to some other acids and also is non-toxic acid which made this available to use it in food industries. The acid comes in two industrialized and natural types with different grades and refer to the customer usages we can supply the purity up to 98% in crystal powder or in liquid shape with the best price. One of the other property of this acid is high solubility in the water for 169 gr in 100 ml at 20 centigrade degrees which is great for this acid. Citric acid with high level of Decriminalization uses for well acidizing in drilling systems as an economical acid with affordable fee in compare to another acids, on the other hand it has a lot of application for flavoring or using in the food industries or color making which made this a useful acid in all global markets. Some other acids like acetic acid, formic acid and etc have some properties as the same as this acid but according to their high corrosion, prices and their shipment, the acid is a reasonable choice. Citric acid is also some flammable in every type and should be avoid to be in warm places. Citric acid since has PH about 4.8 and corrosive properties, shouldn’t be in touch with skin or eyes straightly and also should avoid to breath because it could lead to some hurt to the body. According to this issue, this acid needed to has standard packing and safe shipment in every type of that. ATDM company supply all types of citric acid and exports this matter to all around the world with various packing and safe shipment for the best price and quality.